Don Bradman hit just six sixes in his Test career. Denis Compton had three. Colin Cowdrey cleared the ropes 13 times in 114 Tests. Thilan Samaraweera is in good company, and he knows it. It's a sign of the position he has reached in the Sri Lankan team, after an outstanding last 18 months with the bat, when Samaraweera replies to a question about his newfound penchant for sixes (In his first 52 Tests he had one, but he has hit four in the last two Tests.) "Well I know there are greats in this game who haven't hit a lot, so I'm just fine with my record." Welcome to the all-new Samaraweera. Last year when he spoke to the media during the series against India it seemed he was yet unsure of himself. He searched for words, he appeared shy. The media was something to be wary of, it seemed from his tone. Just over a year on, with the confidence of a man in sublime form and his position cemented, Samaraweera smiles broadly and answers questions with confidence, throwing up stats few would have known. He's even hitting sixes. Samaraweera will never forget 2009. Two double-centuries in Pakistan. A career-threatening injury and the scars of the horrific attack in March. A successful rehabilitation in three months. Two centuries in consecutive Tests against New Zealand, and over 1000 runs in the calendar year. There are Test players who don't experience that in a career. It's been a richly deserved run. A poor tour of England in 2006 resulted in Samaraweera being dropped after the Edgbaston Test. It was a difficult period being away from the national side but he altered his game, spending long days and weeks with Chandika Hathurusingha, the Sri Lanka A coach. "I had to stay out of the team for 20 months and I thought that was too much," said Samaraweera. "Honestly I did really well before that. I had a bad series in India but I played well against Pakistan and Bangladesh before the England series. I should have come back in six or seven months but didn't. That made me hungry for runs." He changed his attitude too, focusing more on scoring opportunities. The recall came for the tour to Australia late in 2007, where Samaraweera played one of two Tests. He was persisted with and cemented his place with a century and a fifty during the tour to the West Indies in early 2008. He hasn't looked back. "When I came back Trevor Bayliss and Paul Farbrace [Sri Lanka's coach and assistant coach] helped me score runs," said Samaraweera, who has been in outstanding form over the past 18 months. "The main ambition was to stay at the crease but look to score runs. That changed everything for me." The belief is evident. Having slowly inched toward Mahela Jayawardene and then outscored him today, Samaraweera spent 14 deliveries and roughly 20 minutes on 99. 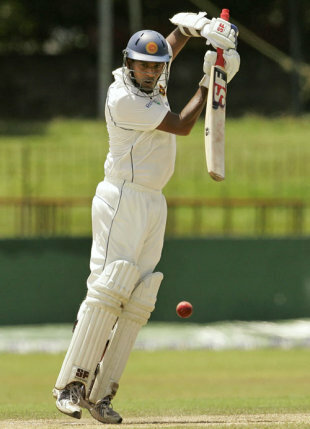 Jayawardene had been cut off on 92 and Chamara Kapugedera was playing his first Test since January. It was a testing period but the desire to play the senior role burned bright. "Being on 99 wasn't important," he said. "Kapugedera was back after a long time and was trying to settle down. I settled him and he settled me." Settle he did, as New Zealand found out. Samaraweera repelled a good over from Chris Martin and raised his century, fittingly, with a cover drive. As most of his other productive shots, it was placed accurately in the gap. Immediately after getting his century, Samaraweera launched an attack, hooking the very next ball for six and then reaching and driving Jacob Oram through the covers for four. Daniel Vettori was driven with exceptional footwork inside-out past mid-off for four and a couple of overs later, on dancing feet, he lofted Jeetan Patel for consecutive boundaries. He repeated that shot soon after, and New Zealand's attempts to make further inroads had been snuffed. "At the moment I am free because the team is doing well," said Samaraweera. "Myself and [Tillakaratne] Dilshan want to take pressure off Mahela and [Kumar] Sangakkara because they've been under a lot of pressure over the last ten years." Samaraweera's form dipped in the three Tests against Pakistan last month, but a sublime 159 in Galle and a flawless 143 at the SSC marks an imposing series. "Full credit to the team management," he said. "They have given me full authority to play positively. They encouraged me after the Pakistan series and said it was a matter of time. In the last Test against Pakistan I got back my rhythm. As for getting 1000 runs in eight Tests, it's just good the team is doing well." Thanks in no small part to Samaraweera's unforgettable run of form.